Oil and Natural Gas Corporation Petro Additions Limited invites Application from all the Indian Citizens for the posts of Executive/Non-Executive professionals on permanent Basis. It is a golden opportunity for all the interested applicants who are looking for jobs in Government Department & are eligible to apply for these Posts in OPAL Department. All the Interested Candidates can apply for this Executive/Non-Executive Recruitment process online Till 25th October 2015. 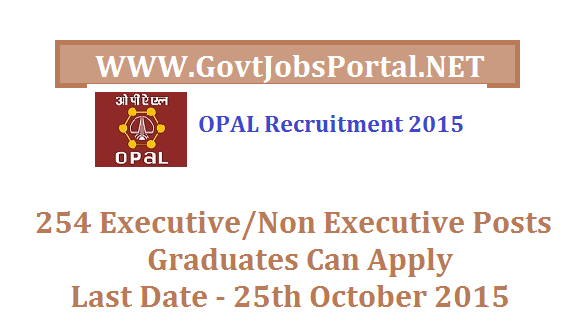 Below in this post we are providing you the complete detail regarding this OPAL Recruitment 2015 notification. Read the complete detail carefully & apply for the required post if you are eligible to apply. Academic Qualification: Applicant Should have Done Diploma/Graduation/ Degree / Post Graduation from any recognized Institute/Board. Age Limit: Applicant upper age limit should be 35/40 Years. Selection Process : Selection will be based on Interview By OPAL Department. How to Apply : Interested Applicants may apply online through their official website http://career.opalindia.in/ before 25th October 2015. Applicants can also apply from the link we provided below.